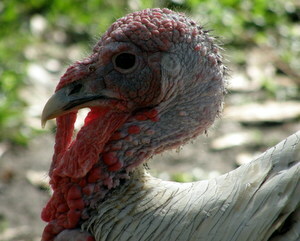 Modern turkey factories have to use artificial insemination. Anticipation, promise and excitement were in the air. The last week of January and the daylight hours slowly increased with each passing day. 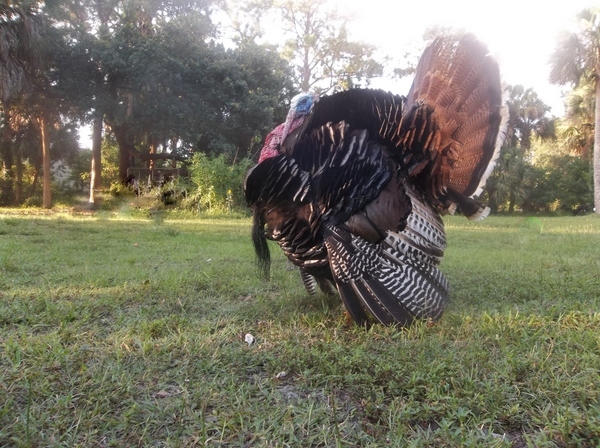 All were grouped on a bright sunny sward where the Florida winter sun could warm the gathering. Noisy teenagers showed off and chased each other. 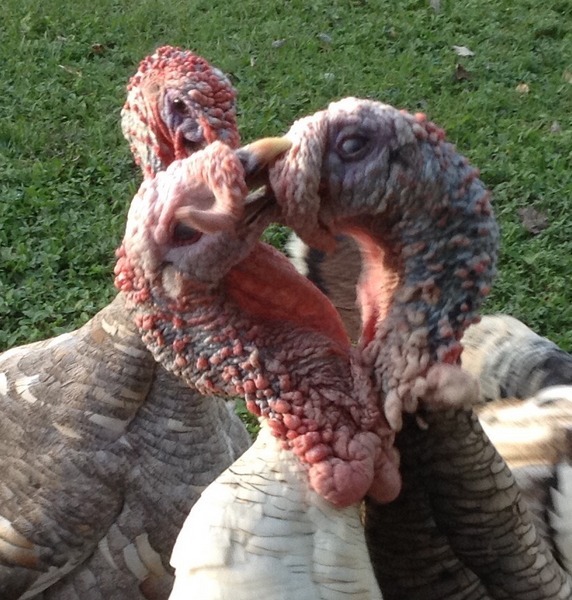 The girls preened and flirted. The elders stretched aching joints in the sunlight. 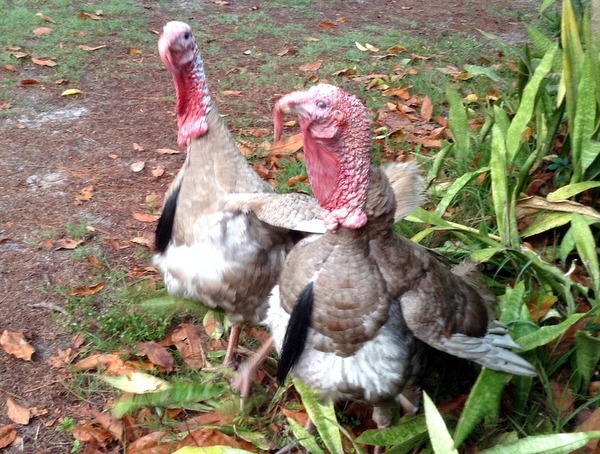 I’m talking Turkeys of course: The toms gobbled and the hens yelped. Increasing hours of daylight had initiated the most ancient of all programing: Courtship and reproduction. Often there is a "Chuffing" sound with the male display. This Elvis Pressley singing drives the hens wild. 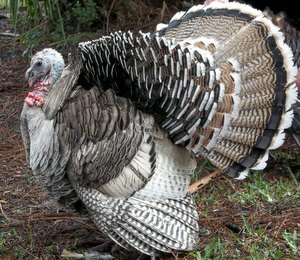 Males with tail fans erect and splayed, snoods elongated, wings lowered to drag in the sand; Blue faces, wattle and caruncles apple red, the toms strutted about sporadically making puffing or chest thumping noises- all signals guaranteed to sweep even the most impervious hen turkey off of her feet. The handsome young Jake with iridescent feathers shining in the sunlight and red/blue bumpy face that makes the hens swoon in passion can only swagger about showing off his tail feathers. 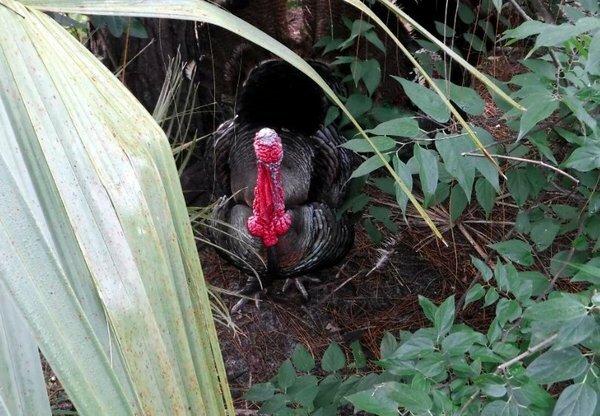 No hens for him this season, or at least until he can best the Alpha male. For only the winner of the Alpha contest will have access to the hens. 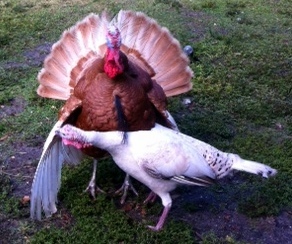 Actually this is a photo of the second place winner, however first and second Alphas will mate with the hens. The fighting between the males had begun soon after the winter solstice was over and the battle scarred victor having defeated all opponents, strutted around the females waiting for their flirting signals that breeding time approached. 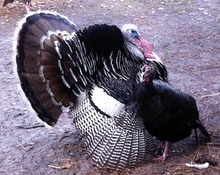 The Tom turkey, unlike roosters will wait patiently for the turkey hen to signal she wants attention. 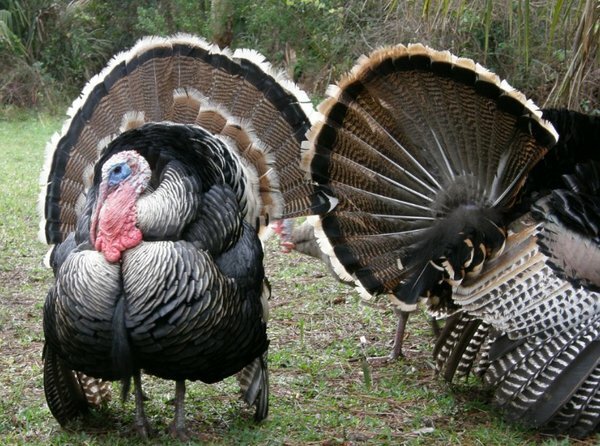 The challenge begins with two males twittering at each other in a turkey version of snarling. Their very posture aggressive: red faced, head lowered, wings flexed; the snarling transforms into “wing punching”. 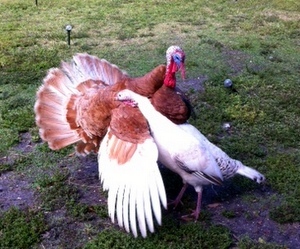 The toms strike at each other with the forward edge of their powerful wings. Wing pulled back to deliver that winning punch! 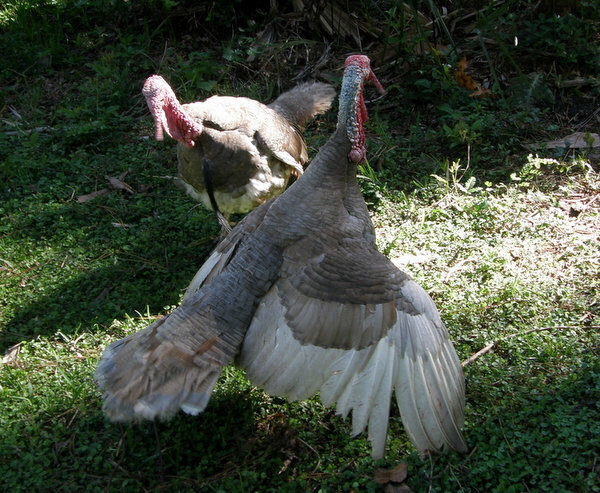 Wing punching graduates to “grappling”, (think two Sumo wrestlers) only the male turkeys use their beaks to grab their opponents by the caruncles or any fleshy part of the face and begin shoving & chest pushing while twisting their opponents head. 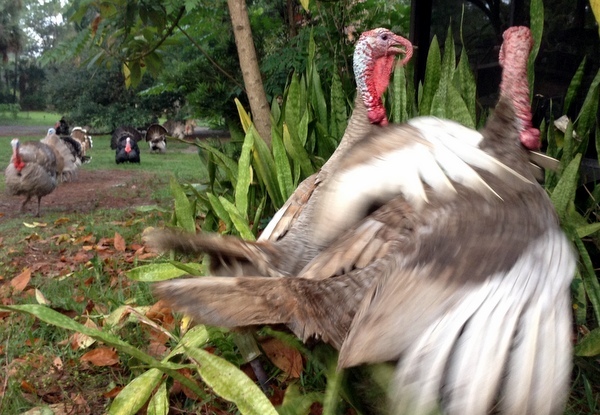 This turkey grappling can go on for days with the exhausted birds only ceasing the fight at sundown and they move into a tree for the night, the battle resumes at dawn and lasts until one of the combatants finally gives up. 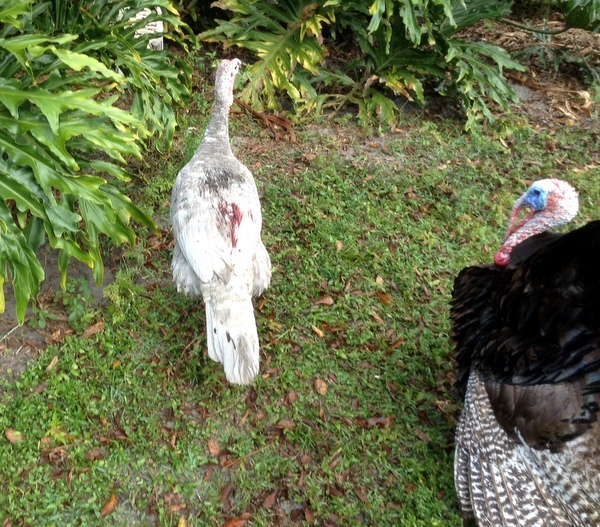 The bloodied and scarred winner wins reproductive access to most of the hens. Flirting begins with the hens “Displaying” like the toms- puffed up, tail spread out-obvious signals to the toms that they are interested. 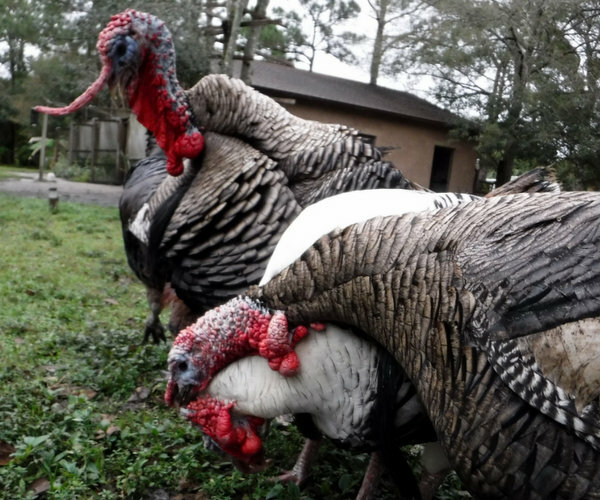 The tail fan morphs into direct contact with to the toms-the hens rubbing up against the toms and sticking their heads under the toms’ outspread wings. Hen in a swoon for the broad chest and long beard! 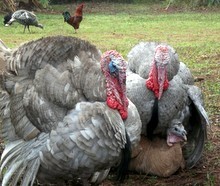 At some point, the Tom's "display" places the hen into a type of a trance and the hen settles to the ground immobile. Quickly with the younger Toms, agonizingly slow with the older Toms. 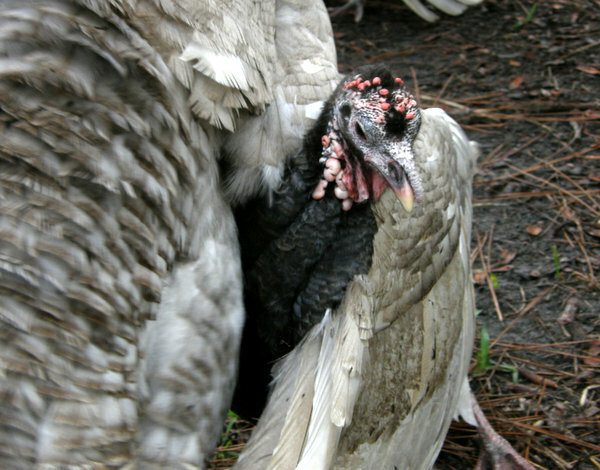 There are often injuries to the hens during the mating process. 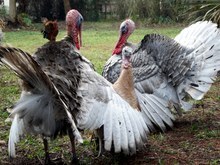 Breeding injuries "The second most common question emailed to me"
Injuries can be as minor as a few feathers pulled off. 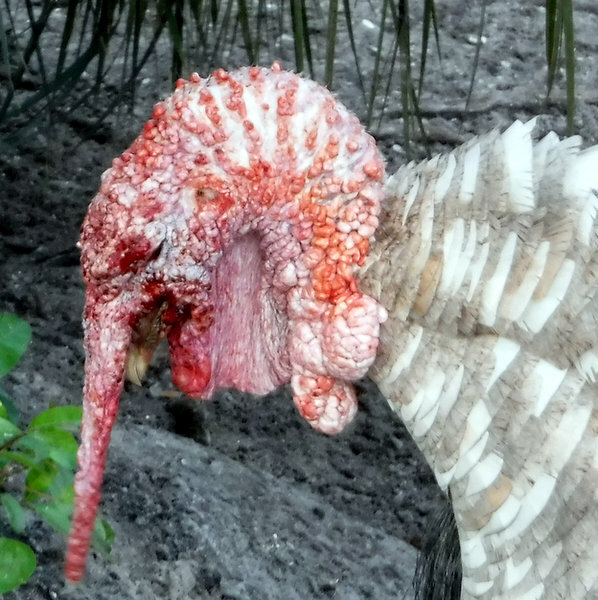 More serous injury’s can be the hens bleeding from the back, to the very serious injury of a broken hip due the overweight heritage tom turkey. Often I will lock up the Alpha winner & allow a "lighter" tom to do the breeding. Especially when the hens are already limping around from previous mating. About one in twenty matings, there can be damaged hip bones. Where are the defeated Toms during this process? There is a pattern, not strong, but still there-- of the older hens to follow the former king into the wilderness for a brief encounter. And of course it is funny when the new king realizes what is happing in his dominion and sprints off after the wayward couple. 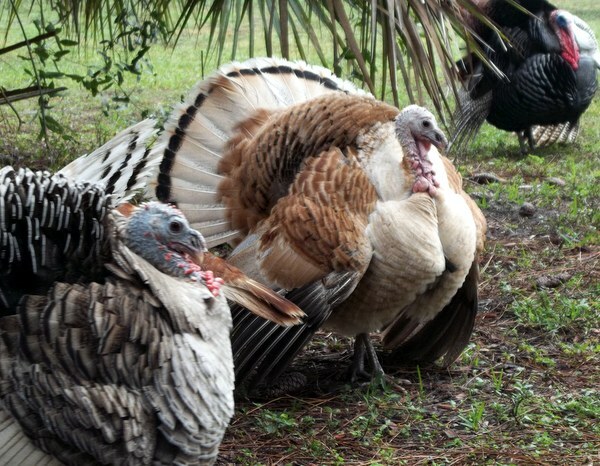 After mating, expect 8-18 days of the hen laying eggs-often she will mate again - sometimes with a with a different tom if the Alpha is busy with his other hens. And then 28 days and dangerous nights of sitting on a nest.